Constructive Alignment is an approach to course design which begins with the end in mind (i.e. what should students know and be able to demonstrate at the end of the course). It assumes that when learning objectives, assessment methods, and teaching and learning activities are intentionally aligned, that the outcomes of learning are improved substantially (Blumberg, 2009). The process of constructive alignment emphasizes that students are central to the creation of meaning, and must be provided with opportunities to actively select, and cumulatively construct their own knowledge (Biggs, 1996). Meyers and Nulty (2009, p.567) provide 5 curriculum design recommendations to designing a course based upon Biggs’ approach to constructive alignment. (5) provide challenge, interest and motivation to learn. The effect of applying these principles is to [create a] learning system in ways that require students to adopt a deep learning approach in order to meet the course’s assessment requirements – which, in turn, meets the desired learning outcomes. There is little doubt that individual instructor’s can have an enormous impact on the quality of students’ learning experience and on the outcomes they achieve, “…high level engagement ought not be left to serendipity, or to individual student brilliance, but should be actively encouraged by the teacher” (Biggs, 1996, p. 353). The process of constructive alignment begins by defining clearly the course learning objectives, such that both the students and instructor are aware of the essential knowledge and abilities that they should be able to demonstrate at the end of the course. Once the learning objectives are clearly defined, the feedback and assessment methods which provide an opportunity for the students and instructor to formatively and summatively assess their achievement of these objectives, should be articulated and developed. Meyers and Nulty (2009) emphasize that assessments tasks should hold together and sequence all other course components. Once the alignment between the learning objectives and assessment strategies has been established, the teaching and learning activities that best support an active and deep approach to learning should be planned. Knight (2001) describes this stage as drawing together the processes, encounters and engagements that best make for effective learning, given both the context and the subject-matter content. We have heard much in academe about the importance of an outcomes-based approach to education. We must continue to add voice by discussing the importance of quality learning environments that emphasize an active, deep and student-centred approach to learning. Although they provide an effective and efficient means upon which to organize, structure and account for learning, quality higher education goes much beyond outcomes and objectives. We must consistently strive to communicate the inherent complexities embedded in the many disciplines and contexts within teaching and learning in higher education. By not taking the ‘constructive’ out of constructive alignment, I think that each of us has the capacity to inspire excellence in student learning. Biggs, J. 1996. Enhancing teaching through constructive alignment. Higher Education 32:347-364. Blumberg, P. 2009. 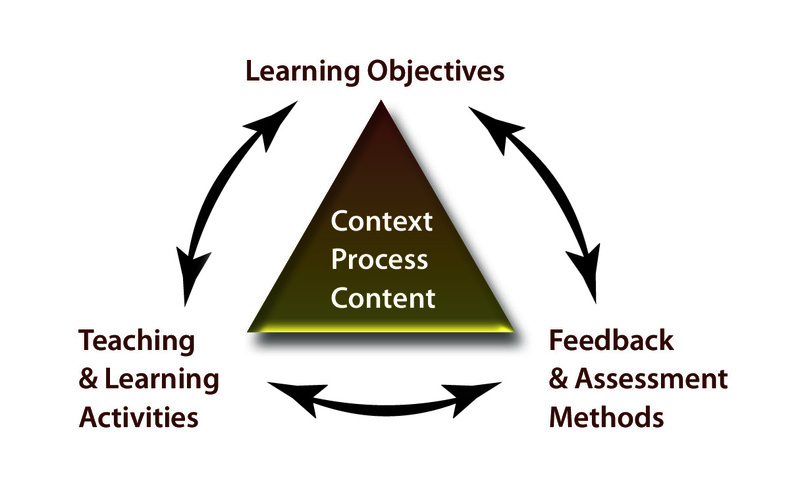 Maximizing learning through course alignment and experience with different types of knowledge. Innovative Higher Education 34:93-103. Knight, P.T. 2001. Complexity and curriculum: a process approach to curriculum making. Teaching and Learning in Higher Education 6: 369-381. Meyers, N.M. and Nulty, D.D. 2009. How to use (five) curriculum design principles to align authentic learning environments, assessment, students’ approach to thinking and learning outcomes. Assessment and Evaluation in Higher Education 34: 565-577.